Victory -Station Yaquina Bay, Newport, Ore.
Invincible II -Station Grays Harbor, Westport, Wash. Triumph II -Station Cape Disappointment, Ilwaco, Wash.
Intrepid –Station Coos Bay, Charleston, Ore. 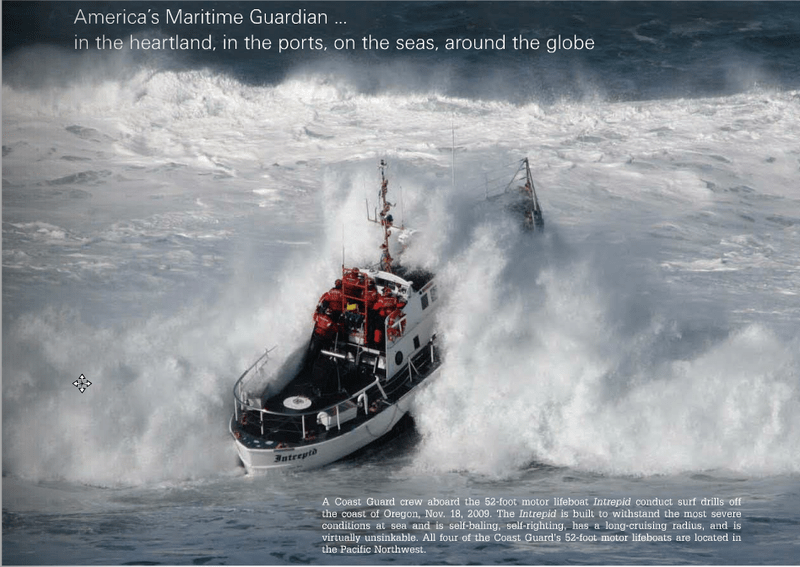 The Coast Guard’s information sheet regarding this class is available here (pdf). There is also a short Wikipedia entry here. These boats were brought to my attention by a reader who felt they needed replacement and further suggested that a replacement might also be useful for seasonal work in the Arctic. I have to assume they have some unique capabilities, for these fifty year old boats to have been retained when first 44s and then 47 foot MLBs might have replaced them. At 32 tons they are considerably bigger than the 20 ton 47 footers, and they have considerably more range. It also appears they have more comfortable accommodations for extended missions. The reader alluded to, recommended a C. Raymond Hunt designed, 61 foot 43 ton pilot/rescue boat, built by Gladding Hearn Shipbuilding. Somerset, Mass, for service in Bermuda. Earlier we discussed the Netherlands’ new 32.5 ton design that might also be an appropriate replacement. There is also more here. At any rate it would be a small class, probably less than ten, but we would not necessarily have to start from scratch in seeking a replacement for these now very old, but apparently uniquely useful rescue vessels. This entry was posted in Uncategorized and tagged MLB by Chuck Hill. Bookmark the permalink. That Royal Netherlands Sea Rescue Institution (KNRM) beach launch rig could be the perfect answer for the Arctic, and the lack of port Infrastructure there. They could be hanger kept during the winter and quickly launched when needed in the summer. A cool looking setup! If they do replace the old venerable 52’s, I wonder if a larger style surf capable boat could find a useful home on both coasts. There is considerable risk in operating these intermediate craft in the Arctic. Because of the lack of port infrastructure they would benefit from beach launch systems that would also allow them to be stored and maintained under cover in winter/inclement summer weather. They would need to have high equipment redundancy and robustness to survive alone in areas with no back up craft. Finally, high speeds and ice do not mix well for small craft. The suggested craft from Damen and the pilot boat are all high speed boats. Floating ice could quickly render either of these boats inoperable or even sunk if operated at speeds. The self righting features would also be highly impacted if topside icing is encountered. The 52-footers are really long in the tooth and have been far from cutting edge for decades. If this very large heavy weather boat is truly still needed then its replacement should be sourced from existing global designs and not attempted in house. Of course, the CG would need to modify the design to account for equipment packages in common use in the States. There are a few running up around Barrow servicing offshore oil islands, I think Crowley might be running them. They haven’t had a very positive experience with the one running to the new airport in Akutan and it is being replaced with helicopter service now. The Canadian Coast Guard has fairly long experience running hovercraft out of a facility near the Vancouver, B.C. airport which is located on the shallow Fraiser River delta. Much larger and you would also have to replace the existing boat houses. The “Vic” is already a tight fit here in Newport. I’ve always been curious what capability these boats have vs. the 44′ & 47′ MLBs. I remember the CG testing (on lease maybe?) some air cushion vehicles back in the 70s. Saw one operating over the ice on the Illinois River when it toured District 2. They were looking at it’s usefulness for light icebreaking and SAR in winter/ice conditions. We noted it was faster than anything else on an icey river. For some reason, even with a lot of experimenting including several different vehicles, they weren’t adopted. Perhaps the technology has matured some in 40 years and it is time to re-visit this idea. My concern, both for in the arctic and Pacific NW, is what strong winds do to craft stability? Note this is a pdf. Check dvidshub.net. You might also email the CG historians office. They may have a high res photo they can send you. I have digital photos of CG-52312 and will be happy to email you some. James Flynn, Historian CG Tug Assn. If the MLB gets larger will it still be a MLB? At 65-foot it would be classified a cutter and probably a WPB. Could a new six-bitter be in the making? Does look like we are getting closer to a boat that could combine the functions of a classic patrol boat and a motor life boat. It is probably bad enough riding a 110 out here on a multi-day patrol. I’d hate to do that aboard something smaller on a regular basis. Agreed…..the design has proved itself over and over. It has out lived the 44 and maybe even the 47. Upgrade the systems to currently used equipment available off the shelf. TRIUMPH was my charge for a few years and brought my crew and I home in some nasty crap. Why reinvent the wheel? It took almost 8 years to develop the 47 from concept to prototype…..
Four years ago this was written, and another month before that I ran the case of my career. My crew and I towed the 170 ton, 80-something foot F/V Steve C across a break bar coming into the Columbia River mouth. We came across with 1100ft of towline out, thought all was well until we found ourselves in over 16′ breaking seas. Triumph more or less broached 4 times; instead of rolling up and over in the trough she straightened up on her towline, each wave covering us in tons of water, and she still charged across the bar as designed. Had we not been on Triumph and instead had been on a 47′ MLB I don’t believe we would have made it through the crossing without a mishap. A good portion of our success was due to luck, but the 52 proved herself to the four on board who were not already believers. Is the 52 old? You betcha. Replace? Nah. You could sink half a million dollars into each of these marvelous vessels and they’d be around for generations. There’s nothing like the confidence you get from an 80,000lb steel hulled boat that has survived worse than what they are allowed to go into these days; being restricted by modern SAR policy pretty much eliminates the need for anything updated because the 52’s have proven themselves over and over again in conditions far worse than what I took her into…. That said, I honestly believe that the mission of the Surfman is going by the wayside. Policies are becoming more safety oriented, and currently a 52′ can only go out at her limitations if she is watched by a helicopter. With that in mind why risk the lives of a boat crew at all if you can safely hoist them up with a helo? Patrol boats on all coasts are doing the same job as the 52′; having served on CGC Sanibel for 2 years and towed numerous F/V’s while serving there I can say that the 110’s can safely respond to any mission a 52′ can provided it isn’t in the surf. I’m saying this as the biggest 52′ supporter I met in 10 years of running them, except for maybe CWO Beth Slade. The USCG has always been the organization that makes do with the least funding of the five services. I think it’d be a waste of money to build replacements for these boats. Rehab and update, that’ll save money that the service could put towards their ambitious plan for new cutters. If not then just get rid of the niché mission the USCG only keeps around because we keep the 52’s in service. Thank you for your service and BZ, BM1 Mantell. The 52s are workhorses, as your story illustrates. The 47 is a great for what it does, but the 52 provides stability, towing capacity, and range far in excess of what the 47 can provide. With four bunks in the bow, it can carry two crews on extended missions. They are remarkable vessels and well-suited for the PNW coast. The summer before my son’s senior year, when he was looking to enlist in the USCG, we toured Station Yaquina Bay and the Victory in Newport OR. When we called to see if we could come in for a tour, we were told “gonna have to be this afternoon, we’re working kind of a big case right now.” You can see the “big case” at https://www.facebook.com/USCoastGuardStationYaquinaBay/posts/1269382093071786. If I remember right, it was an 11-hour tow. The BM2 who gave us the tour said it was the biggest tow he had ever done. I doubt a 47 could have brought that boat in. Big ol’ boy there! Yep, they don’t make lifeboats like this anymore. Fun fact, the guy standing on the stbd side of the Vic is BMC Sean Crahen, one of the guys who had a hand in my certification process all the way from crewman to Surfman on both platforms. He’s an interesting cat, his whole approach to running boats was very different from anyone else I met in my service time. He is a very sharp individual who was able to dissect every part of everything going on around him from a more technical approach than the rest of us. It was a real treat to learn from him, He’s a fine leader and a supremely capable seaman. I’ve served on the Invincible from 1980 to 1982 that boat pulled us through so many situations I would ride it before I would ride any of those 47 foot boats. And if it works and it ain’t broken don’t fix it. I just saw the Invincible this year refitted with new engines and new generators. She’s been brought up to date and there’s no reason she can’t serve another 50 years. She’s been doing the job she was built for. And she can still do it. We do not have to reinvent the wheel. Why start over when she’s already doing the job doing it well why start over. We made the investment she solid she’s up to date let her work.